Steam was the source of power that drove the industrial revolution. 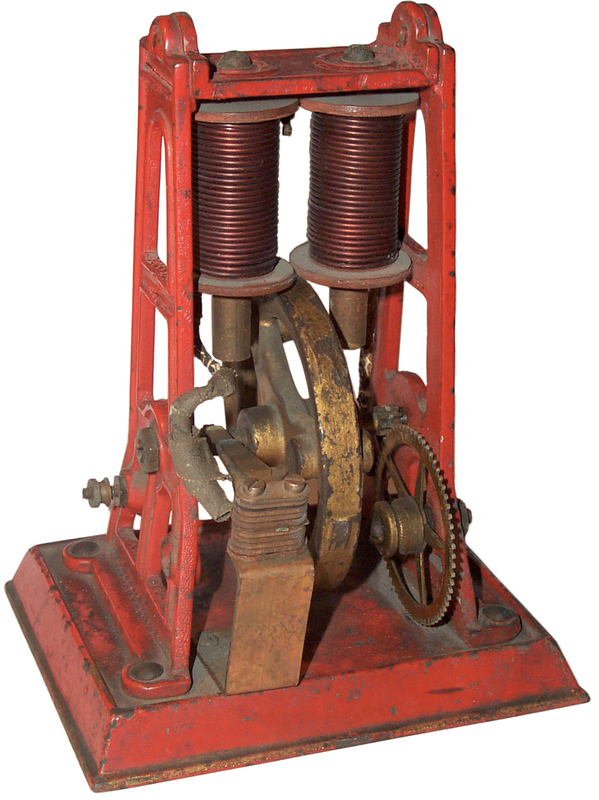 Steam gave way to combustion engines and electric motors as the source of power. So you would expect that the men who knew steam and how to use it would look to the newer technologies to see what could be done. 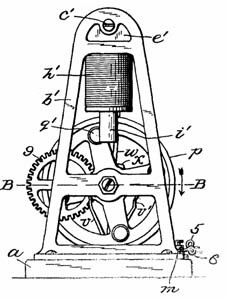 The inventors of the Electromagnetic Toy Engine (see patent 882681 below) were Harry G. Hawekotte & Henry W. Klausmann both from Indianapolis, Indiana. 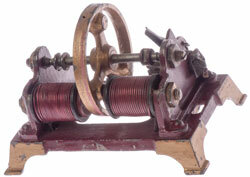 The five patents below have the name of one or the other of the inventors of the Electromagnetic Toy Engine. It's clear that these men know about steam machinery and how it worked. 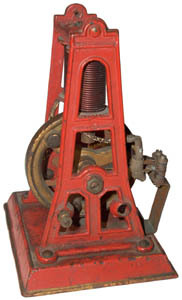 The reversing feature on the Toy Engine is a direct descendant of what's was commonly done with steam engines. The Excavating Machine patent is based on a steam powered "donkey". If you know anything about Harry G. Hawekotte or HenryW. Klausmann from Indianapolis, Indiana or who made this Toy Engine, please let me know. 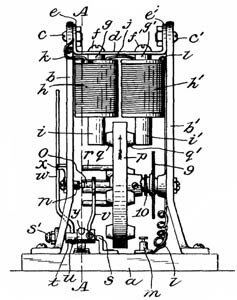 Some of the other patents listed also use an electromagnet in an engine that's made to appear similar to a steam engine. This works since an electromagnet pulling in an armature (i.e. 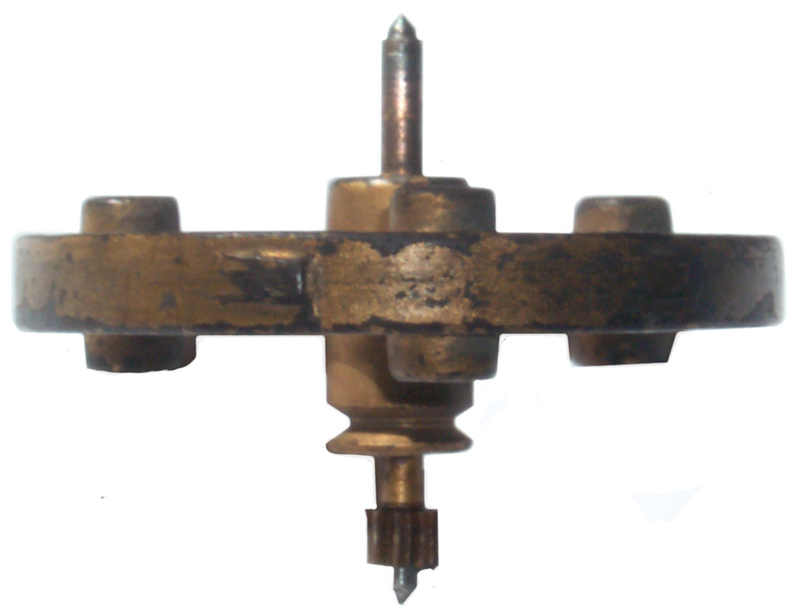 a solenoid) operates in a manner very similar to a steam powered piston. 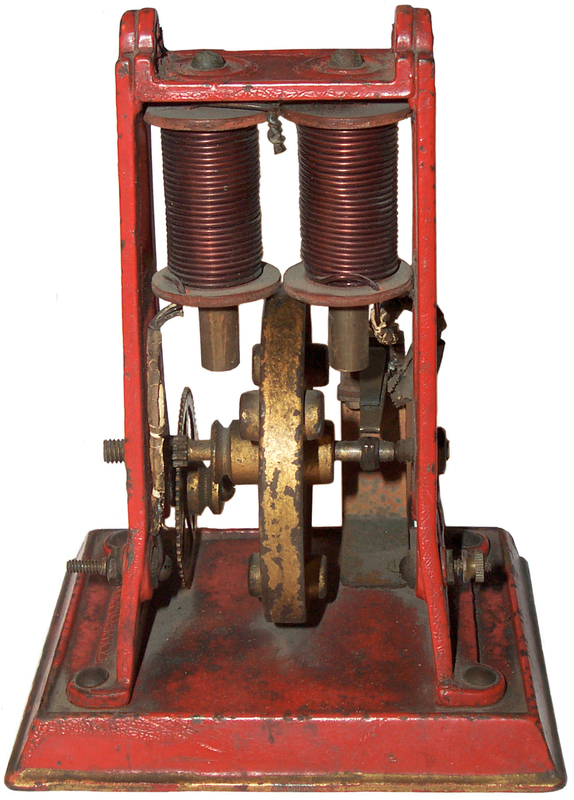 A Solenoid is a cylindrical coil with an air core. Typically a magnetic plunger is pulled into the core when the coil is activated. An Electromagnet is a cylindrical coil with a magnetic core (typically soft iron or electrical Silicon steel). 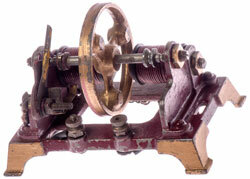 The company name was H-K based on the last names of the inventors (patent 882681 Electromagnetic Toy Engine, H.G. Hawekotte & H.W. Klausmann, Mar 24, 1908, 310/46 ; 310/1; 310/83). This company made a large number of toy variations that all used the flywheel and a pair of electromagnets, i.e. the key patent. My interest is because this motor uses Electro-magnets instead of the more modern rotating type motor. Electro-magnets were the first electrical component and were the foundation of the Telegraph, Stock Tickers, Teleprinters, district alarms, self winding clocks, Bells, Buzzers, annunciators and many other things. The thing that separates electro-magnetic toy engines from model steam engines is the sound they make. Model steam engines make some interesting sounds, especially those with more complicated valving or auxiliary attachments. The electromagnetic toy engines make a sound that's similar to a gas engine and for me has more character. Arrived needing a cleaning and a little electrical repair. 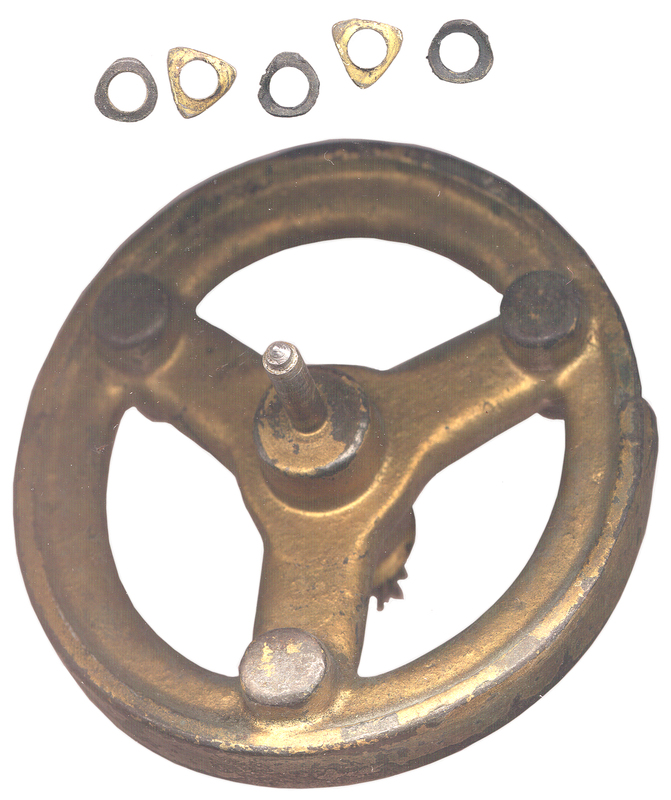 The reversing lever was not fitted and the flywheel does not have the 4 pins (left & right bumps) shown in Fig. 6 as "r". There are a number of improvements from the details shown in the patent. 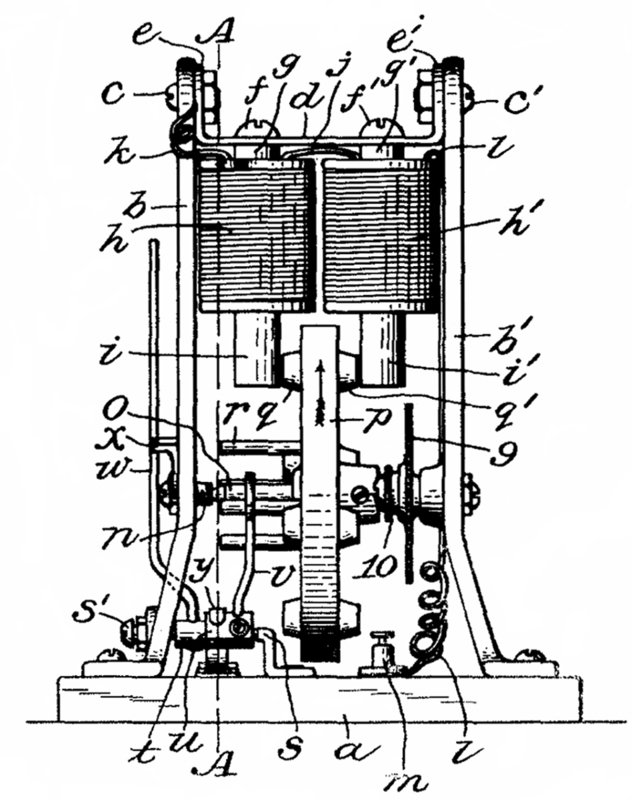 For example this Toy Engine has 3 armature bumps on the flywheel and the patent shows 4. 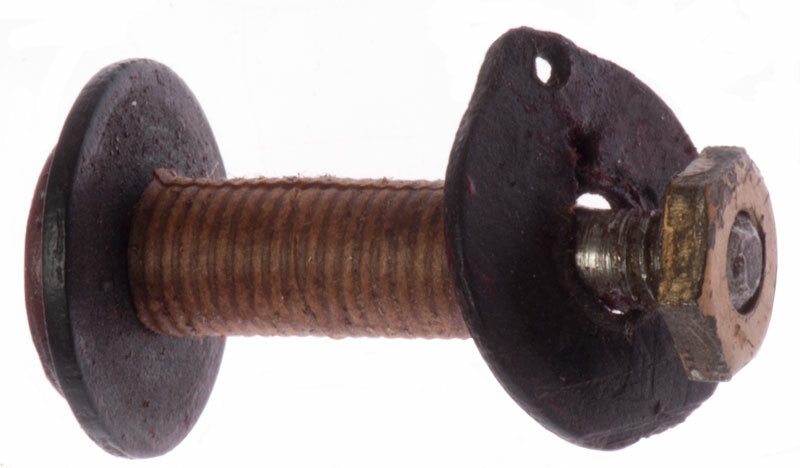 Tubular rivets are used instead of screws and bolts. Sending current through a moving joint is not a good thing. This was found to be unreliable in clocks and I'm sure that's the case here. 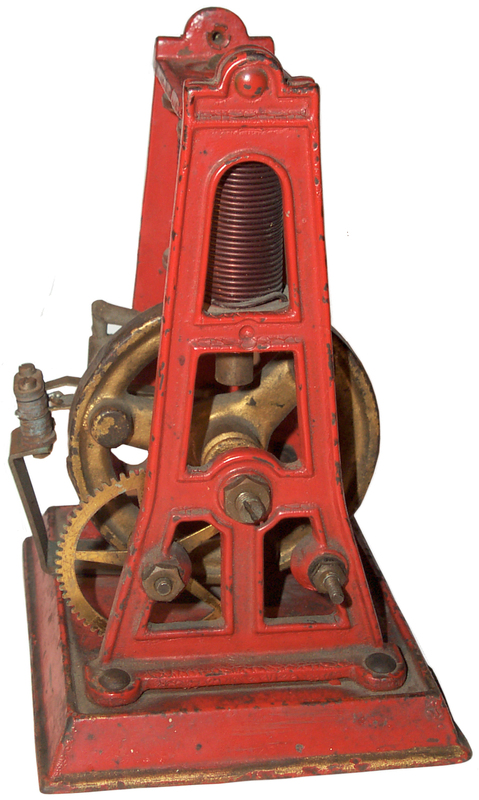 The commutator leaf contact is similar to the Hourly Winding Switch in a Self Winding Clock Co. "Western Union" clock. This motor does send current through the spinning flywheel. The lower leaf is an electrical conductor and the upper leaf is a spring to press it down. On the flywheel shaft (0.187" OD) there are 2 metal parts with three lobes. These are surrounded by 3 black insulating parts. The insulating parts are supposed to keep the lower leaf from making contact except when the pointed lobe sticks up. But the 3 black parts have worn down to the same shape as the metal parts so this function is no longer working. The triangular metal parts have a radius 40 mils larger than the shaft at the low points and 100 mills larger at the high points. If the insulating washer was half way between it would have a radius 70 mills greater than the shaft, or 0.327" dia with a center hole slightly smaller than 0.187". The insulating washers are about 0.040" thick, but I don't think that's a critical dimension. How to fix? Let me know your idea(s). Here is an edge view of the flywheel with the communator parts removed from the top shaft. There's a bump on the OD of the flywheel a little to the left of center, not sure why it's there. Measuring the flywheel is sure easier when you have a couple of 123 blocks. I figured out that the insulating washers really are not needed if the contact arm is positioned exactly in the right spot and the cam is rotated to somewhere near the correct timing. So after a little experimenting the engine is running, see video below. At one cam timing the electromagnet turned on when one of the bumps on the flywheel was between the electromagnets. The power was so great I could not move the flywheel (the frame was warping allowing one of the bumps to tough an electromagnet). This says the motor can do much better than what you see in the video if the cam timing is adjusted properly and the electrical circuit does not have much resistance. I tried to use a bench supply good for 1 amp and the motor barely could over come the frictional losses. I expect that considerably more than an amp is flowing from the Energizer 529 volt lantern battery. The 529 data sheet does not have any information about how much current it can source. See Electromagnet Analysis below. It's interesting that the sound is very much like an engine rather than like an electric motor. Every time the electrical circuit is made there's a thump and a different kind of sound when the circuit opens. There is a lot of sparking at the contact points so a snubber circuit is needed. There are a number of possible circuits, but it will be interesting to see if one lets the motor run stronger than another. Wire: 0.052" dia -> AWG # 16 -> 248.9 feet/Ohm. Winding dimensions: 1.575" long x 0.880 O.D. x 0.375 I.D. 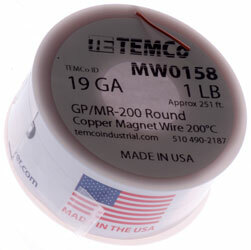 300" = 25 feet for a resistance of 0.100 per coil or 0.2 Ohms total for the two coils. Measured with HP 34401 in 4-Wire mode 0.093 and 0.129 for a total of 0.222. Measuring the voltage across both electromagnets (from the hot coil thumb screw to the commutator leaf) and connecting the Fresh 6 Volt battery to the same two points using different wires (to get a Kelvin connection) shows 1.7 Volts across the pair of coils. This translates into a current of 8.5 Amps. The current is being limited by the resistance of the clip leads and the battery internal resistance. The Red and Black leads connected in series measure 0.10 Ohms. Reality check 6 Volts - 0.85 V (clip leads) - 1.7 V (coils) = 3.45 Volts. 3.45 V / 8.5 Amps = 0.4 Ohms for the battery internal resistance. Not accounted for are the resistance of the flywheel to frame joint, the cam to leaf joint (where the sparks are) and the cam to flywheel press fit joint. While doing the above tests where the electromagnets were energized bypassing the contact points it could be seen that the electromagnets were strong enough to warp the frame and one of the bumps on the flywheel would contact an electromagnet pole. By placing a round tooth pick between the lower electromagnet washer and the frame on each side the frame is greatly stiffened and this problem goes away. You can see the tooth picks in the Chapter 2 video above. This has the sound of putting a brake on the motor and the flywheel seems to slow down. The sparks at the cam to leaf contact go away, but at a high price in terms of performance. See the Chapter 2 Video above. Most clocks that contain electromagnets use a resistor with a value about 10 times the coil resistance in parallel with the coil. When the current source is turned off the coil generates the same current in the opposite polarity. If there's an open circuit the coil will develop a very high voltage to try and get to that current. If a resistor is in the circuit the back EMF voltage will be the source current times the resistor value or about 10 times the coil voltage when being driven. A problem with this method is the wasted energy during normal operation of the electromagnet. Spark ignition engines have used a capacitor across the primary of the spark coil since the early 1900s. The instant the points open the coil tries to generate a current and it can do that through the capacitor. As the capacitor charges up the coil is decreasing the current. The voltage rating of the cap needs to be able to handle whatever voltage the coil makes which may be 10 or more times the source voltage. It would be interesting to use a modern control circuit that allowed dynamic adjustment of the cam timing. I think this would result in much more power output and maybe other features. I'm thinking of ways to do it that would involve opto electronics, power MOSFETs, a PIC micro controller and an LCD display. A simpler way might be a lever that pivots about the flywheel shaft and carries a couple of photo sensors that detect the bumps on the side of the flywheel. One photo detector turns on the power and the other turns it off. By rotating the lever the timing of the turn on can be changed and by moving the second detector relative to the first one the duration of the on time can be controlled. looks like the Fairy Electric Engine maybe Henry was an inventor for hire? Used in a stock ticker transmitter. 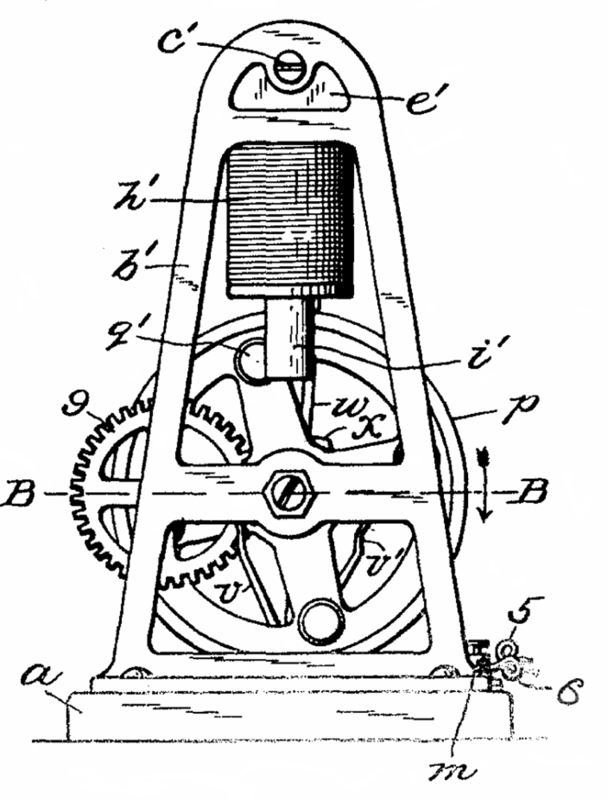 When the operator presses a key the motor revolves the shaft thus pulsing the wire a number of time that depends on what character is being sent. The direction switch activates the left pair or the right pair. uses the same dual pair of coils hidden inside the sheet metal "engine block"
an armature with a number of legs that are attracted to one of two electromagnets to rotate a shaft. 315161 Electro-magnetic Motor, C.G. Perkins (Imperial Electric Light Co), Apr 17 1885, 5 parallel connected field EMs = 5 poles & 4 iron armature poles. a flywheel is powered by two electromagnets, one on either side. The comunating is done by one of two contact arms selected by a level, the direction of motion is reversed by throwing the lever. The output pully is on a shaft that's geared down from the main shaft. a single coil electromagnet, using a laminated core, drives a rotating armature. 1291819 Electric Motor, M. Fogel, A. Ascher, Jan 21 1919, 310/23 ; 310/34 - has the appearance of a horizontal steam engine where the electromagnet is inside the pseudo steam cylinder. 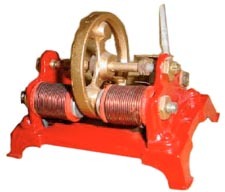 Has the appearance of a horizontal stationary steam engine and makes a "gas engine sound". an electromagnet operating as a solenoid oscillates back and forth as it drives a disk which turns a shaft. The solenoid is only powered for a fraction of the time so battery life is long. A No. 6 battery is shown as the power source. 2894154 Electric Motor V.P. McVoy, July 7 1959, 310/23 ; 310/34 - has the appearance of a stationary vertical steam engine, supposed to be a real motor. These are Electro-Magnetic engines, i.e. they have a strong resemblense to steam engines. This is a photo from eBay of what appears to be the little brother to the above Toy Engine. If you have one of these for sale let me know. The coils appear to be shorter and use smaller wire then the above Toy Engine, but it's hard to tell. This little brother engine was shown running from a 6 volt battery. Got the engine shown in Fig 1 and Fig 2 from M. A. 10 SPril 2017. But it turns out that the left coil in Fig 1 is open, so need to be unwound to see what's wrong. The first step is to remove the coil from the chassis and check both leads hopefully the problem is with then rather than inside the coil. Fig 4 the 19 AWG wire has arrived. I've tried 2 times to wind a new coil and both times the inner most turn shorts to the core. The problem is that the right end in Fig 3 is not fixed but instead depends on the nut to hold it in place. So when the winding is finished and the nut and spacers removed to allow installing on the motor frame a turn moves then gets pinched. Need to sleep on how to get around that.